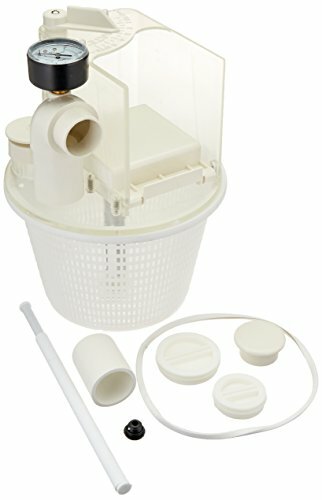 A multi-function vacuum/skimmer attachment. The addition of a Vac-Mate in most skimmers allows you to control a suction cleaner while maximizing surface skimming, all with one simple setting of the control handle. Skims pool surface continuously while cleaner is operating. Traps debris in Vac-Mate basket before it reaches pump pot. Replaces most control mechanisms supplied with pool cleaners. Makes any suction type pool cleaner and wall skimmer fully automatic. Fits Pentair pool products1 S-15VF, Certikin HD100, Filtrite SK950,910, Hayward SP1070, Jacuzzi PMP9411,9989, Kafko, Nally P1000, Pentair pool products 506300 Series, PoolRite, Quiptron, SwimQuip U3. Measures 13-1/4-inch length by 30-1/4-inch height by 20-1/4-inch width.